A key feature of randomised controlled trials is that the groups in the trial are treated identically except for the experimental treatment. With dietary interventions this is near impossible, although at the very least, clinical trials with a multifactorial diet intervention such as ODHS and STARS should not be considered adequately controlled for the purposes of drawing conclusions regarding the effects of replacing SFA with PUFA. Arguably none of the trials should be considered well controlled for this purpose due to dietary advice to reduce TFA which only given to the experimental group. That being said, it is still worthwhile to pool the results of these trials together and categorise them based on how well controlled they were, while acknowledging the issue of unequal advice to reduce TFA intake. In this post the trials are categorised as ‘adequately controlled’ or ‘inadequately controlled’. 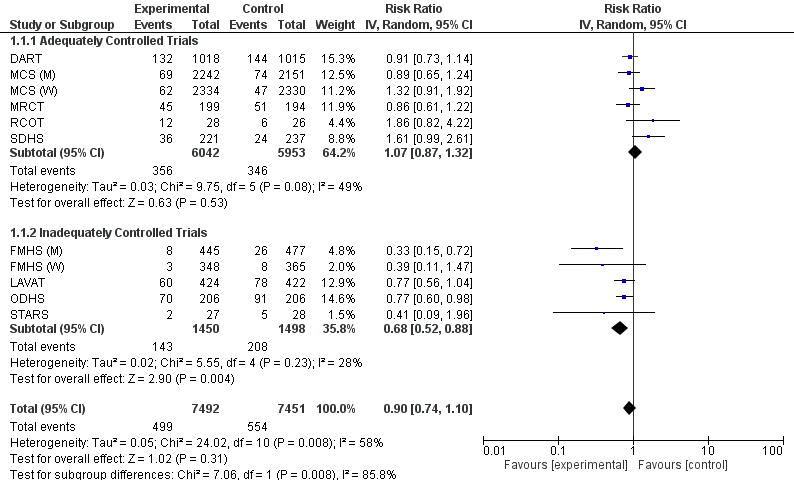 Clinical trials that are categorised as ‘adequately controlled’ are those that most closely approximate a true test of replacing SFA with PUFA, while the clinical trials categorised as ‘inadequately controlled’ have too many dietary and non-dietary differences between the groups to be considered close to a valid test of replacing SFA with PUFA. Due to the uncertainty regarding TFA intake in SDHS, I’ll have a separate set of results that excludes it. For a summary of the results see the table below. Simply pooling the trials together suggests a ~10% reduction in CHD events and CHD mortality which doesn’t reach significance, with no effect on total mortality. However, differentiating the trials based on whether they are adequately controlled or not tells a different story. Pooling the results from the trials that are considered adequately controlled results in an RR that is consistently very slightly above 1.0 (not significant) and excluding SDHS from this category lowers the RR to approximately 1.0. Meanwhile the pooling the results of the inadequately controlled trials results in a highly significant reduction in CHD events and CHD mortality of about 30%, but total mortality isn’t affected, even in this category, which is quite surprising. 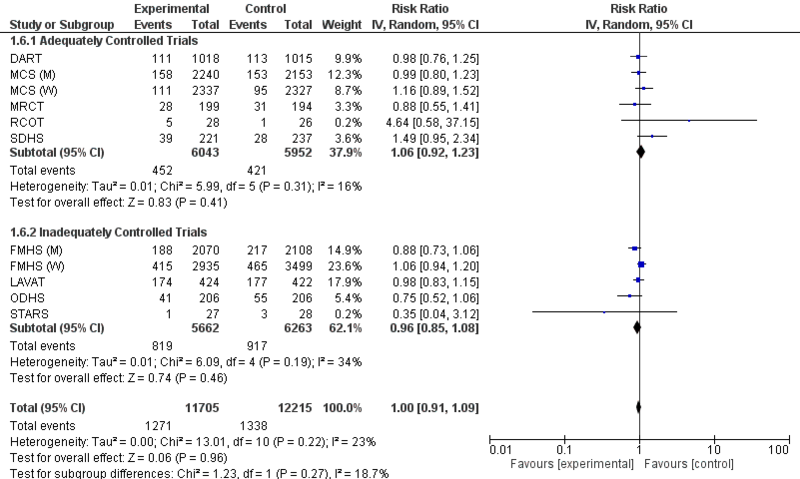 Altogether this suggests that it’s extremely unlikely that replacing SFA with PUFA was responsible for the reduction in CHD in the inadequately controlled trials and that it was most likely due to the other differences that are summarised in the table above. dietary PUFA and CHD risk is inconsistent and is unreliable." Against such faith, the gods themselves will struggle in vain. Thanks, and I agree. What's the point of doing research if you 'know' the answer regardless of the result? Brilliant again Steven! It's nice to have all this information in one place, and thanks for clarifying the discrepant figures seen in different analyses, it has really been helpful. I have to say, this website should be a lot more popular!